Remains "Not Out". Still bats well and scores brilliantly for the Cricket World". PAGE UPDATED: 15th November 2003. Former Test Match Panel Senior Cricket Umpire. Professionally Qualified Umpire, Scorer and Training Instructor (England). Senior Manager in Industry. it in numerous avenues, in Sri Lanka and in England". BY AJITH C. S. PERERA. The most memorable day to cherish in my cricketing life! Going out to umpire with TCCB test match umpire Don Oslear, the four-day County Second XI Championship Match, Lancashire vs Somerset, in July 1990, at the main Test Match Square, Old Trafford Manchester, England. With Tom Smith M.B.E. and David Whiley, at the Long Room 'Lords' in 1985, when I gained a Grade 'A' pass and qualified professionally as a Full-Member of the Association of Cricket Umpires England. for the sake of Cricket". I can think of few people in the world who are better qualified to advise young cricketers on how they should strive to play the game of Cricket than Ajith C. S. Perera. He is not only qualified academically and professionally in the field of Cricket, first as a player with a brief experience of division-one cricket, later as a test-match panel senior umpire, a competent scorer, and as a training instructor and examiner for both umpires and scorers, but also in the sphere of Chemistry. He has won international admiration for his achievements and contributions in both these fields. He is a Master of Science Graduate in Analytical Chemistry, a qualified Chartered Chemist and a Fellow of many a reputable international body, yet, he has unhesitatingly sacrificed a lucrative career in this profession for the sake of Cricket, the game he loves. He uses his wide knowledge and experience of the game gained in both Sri Lanka and England wisely. All these attributes, together with his experience in teaching at the Colombo University and later his man-management in industry, are invaluable assets in preparing a book of this nature. His persistence and overwhelming sense of sportsmanship and fair play, are qualities that any aspiring young cricketer would do well to emulate. 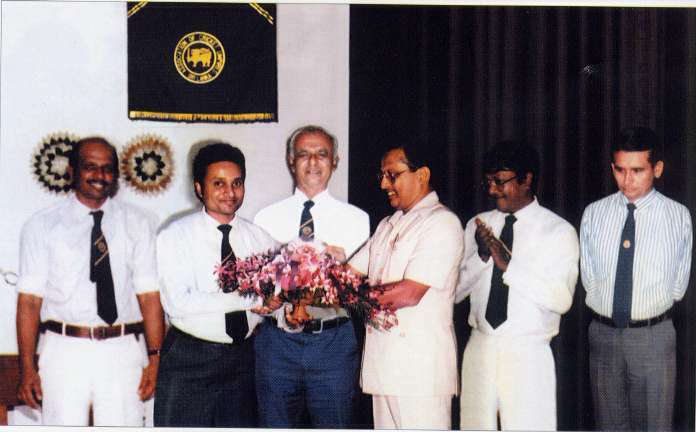 Being congratulated soon after the seminar titled "The Effective Umpire", which I single handedly organised in 1987 for the Sri Lankan Cricket Umpires under the guidance of Upali Mahanama. Far right is the former Sri Lanka Cricket Captain Michael Tissera.
" He has continued to show his resilience and dedication to Cricket." Ajith C. S. Perera was a Senior First Class Umpire in Sri Lanka with over 17 years of experience and I met him often on the Sri Lanka cricket scene. However, I came to know him closely when he single handedly organised a Seminar in September 1988, for the Association of Cricket Umpires Sri Lanka on personality development titled The Effective Umpire, for the upliftment of the overall performance of an Umpire. He invited me to speak on that occasion and so we met regularly. 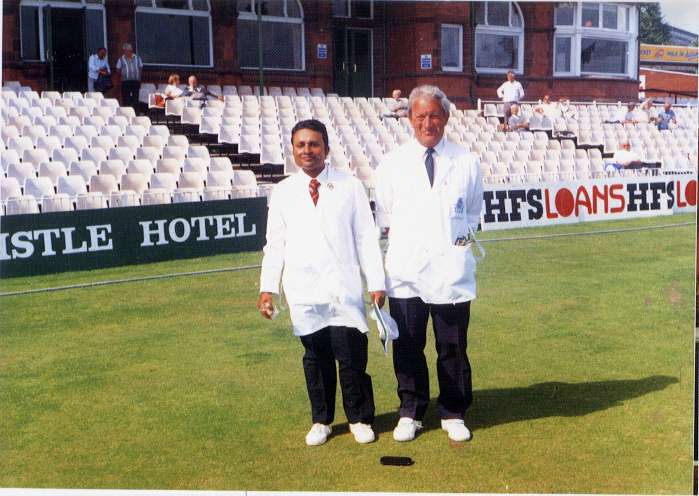 Ajith always struck me as one who was very conscientious in his umpiring duties and one who was keen to improve his knowledge and to that end, he arranged to qualify professionally in England, taking the opportunity also to do a practical stint of umpiring in Lancashire for a period of 16 weeks, at his own expense. His enthusiasm and commitment were such that there was not any doubt in my mind that he would soon reach greater heights. In fact he went further than passing the examinations and was confirmed as a competent training instructor. The Association of Cricket Umpires and Scorers of England have subsequently afforded him the opportunity, to gain the skills needed to qualify as an examiner as well. His ultimate goal was to become a Test Match Umpire and predictably the Board of Control for Cricket in Sri Lanka, appointed him to the Six-Member Test Match panel in 1992. But fate took a hand and he was very cruelly deprived of standing in his First Test Match, because of a freak accident that resulted in him instantaneously becoming a paraplegic. This would have broken most people, but not Ajith. He has continued to show his resilience and dedication to cricket by becoming an author and a cricket historian. 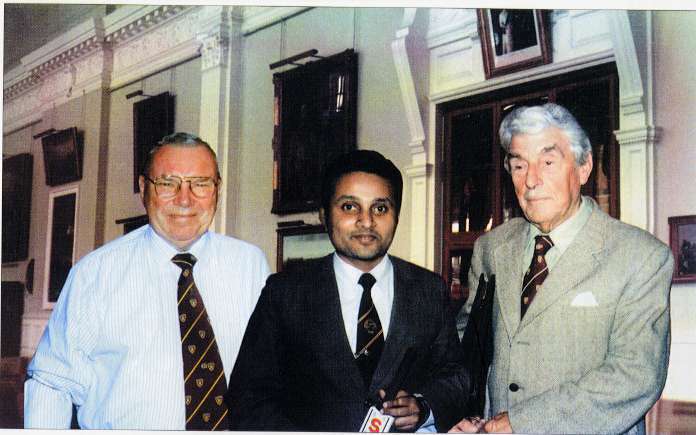 In the company of few eminent cricket personalities, on being invited to visit Englands Cricket Headquarters TCCB and the MCC at Lords in 1991. 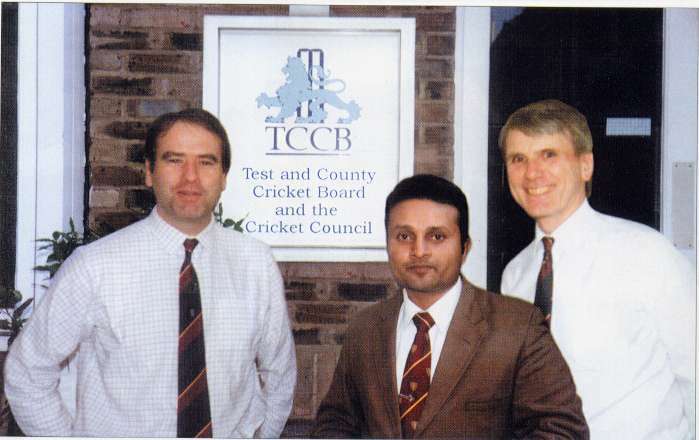 With Tim Lamb, the present Chief Executive ECB and Tony Brown, the then Administration Secretary TCCB. With John Jameson, Secretary (Cricket) MCC. 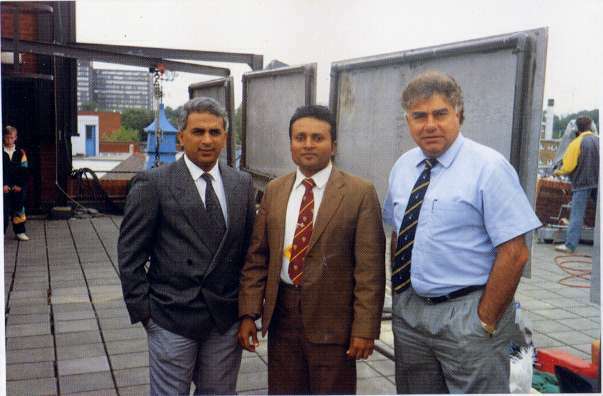 With Indian Masters, Sunil Manohar Gavaskar and Farokh Engineer. "So determined and thorough whenever he has a cricketing project in hand". Cricket Correspondent of The Times. BBC Cricket Commentator. Ajith Perera is one of the most enthusiastic cricket-lovers I have ever met. He is also so determined and thorough whenever he has a cricketing project in hand that he might in those two respects, at least, be termed a Sri Lankan Don Bradman. Of course he was not himself a famous player and fate decreed that he would not be the famous umpire he was on the way to becoming, when meeting with a tragic accident. 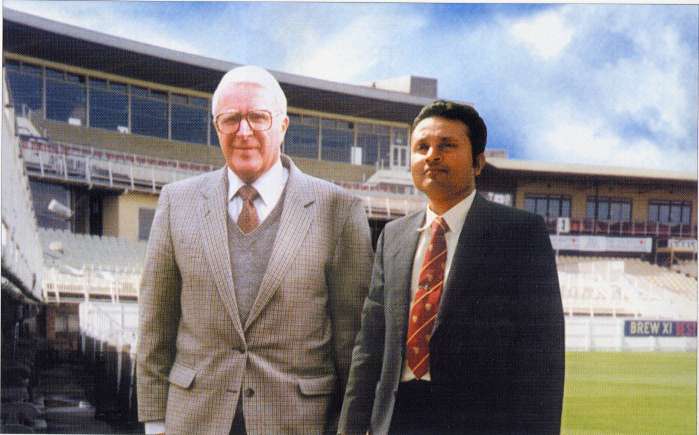 K. T. Francis and myself, with the panel of competent assessors of the ACU England at Old Trafford Manchester in 1990, on successfully qualifying as Professional Training Instructors. 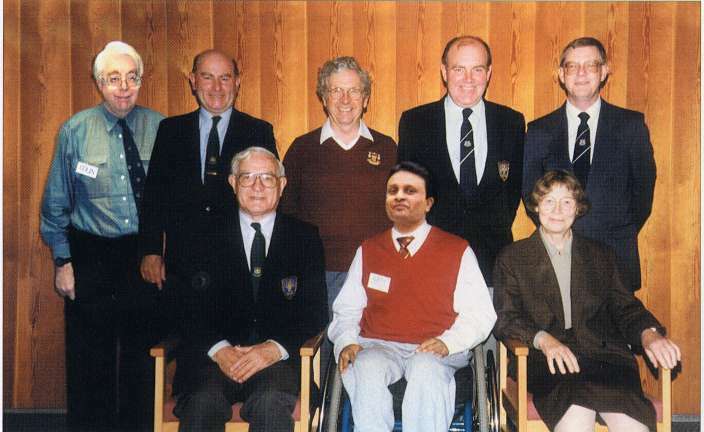 Amongst the best Training Instructors of the ACU & S England, on being invited to attend their annual Training Seminar in 1998 at the University of Keel. "His devotion, dedication and addiction to Cricket would not let him forego his passion for the game". 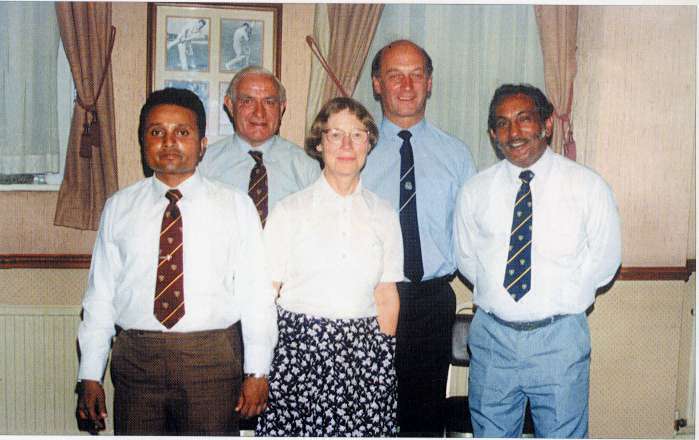 Founder Member and General Secretary (1978 - 1996), Association of Cricket Umpires & Scorers (England). Member M.C.C. for ~ 40 years. As the (former) General Secretary of the Association of Cricket Umpires and Scorers, England (1978 - 1996), I deem it both an honour and privilege to be invited to provide this commendation of the credentials of an author, experienced and courageous enough to write, "Thinking Cricket - The Players Guide to Better Cricket". In my view, Ajith Chrysantha Stephen Perera has few peers when it comes to judge his aptitude and competence to address such a wide-ranging and daunting subject. It is now close to quarter of a century since he first wrote as an aspiring Umpire to enquire of me, in England, what steps he should take in seeking to qualify professionally as a Full Member of the, then, Association of Cricket Umpires, England. Even in those early days of what would later develop into a mutually respectful relationship, the perceived extent of his unbridled enthusiasm, the level of his intended personal commitment, high degree of technical knowledge of the game, analytical mind, plus his unquenchable thirst for newer knowledge and willingness to improve individual performance, collectively led me to believe that he would achieve his ambitious quest with honours (1985) and even go on to become a well respected official at the highest level of the game. Indeed, as the programme of his career development unfolded, my original assessment of his potential, was seen to fall someway short of his ultimate unique achievements, as he matured into both, mentor and tutor to others in his own right. (Single-handedly, he organised a highly successful training program for Sri-Lankan colleagues in 1988 titled: "The Effective Umpire"). It was at this time, when the Association of Cricket Umpires England itself decided to provide both training and examination, leading to the qualification of Scorers at advanced level to complete the third team of officials in Cricket. Recorded history confirms that in early 1990 Ajith Perera was amongst the very first candidates to achieve this double professional qualification. Indeed, his energy and motivation for the betterment of the game were such that, he also became the first (and the only) official in Sri Lanka, to additionally qualify (in August 1990) as a Senior Training Instructor in the art and craft of both Cricket Umpiring and Scoring. This further extension of his talent in the tutorial field, should not have been all that surprising when one considers there would appear to have been a latent genetic element to his origin. His father, Instructor Commander M.G.S.Perera, later the Director of his countrys Naval Training and subsequently, also appointed as the Training Staff Captain of the Ceylon Shipping Corporation, was the First Training Officer of the Sri Lanka Navy, training generations of officers, sailors and merchant navy cadets on board and was also the creator of the Naval and Maritime Academy in Trincomalee. Thus the predisposition for coaching and discipline were already in Ajiths blood. This incipient talent for teaching was to blossom further in his earlier appointment to lecture at the University of Colombo, to be supplemented, in turn, by eleven years of vital man-management in his professional career as a qualified Chartered Analytical Chemist holding key Senior Managerial positions in the pharmaceutical manufacturing industry, which again involved him in the training and development of his and other departmental staff. In search of wider practical experience, Ajith visited England to undergo fifteen weeks of enhanced training which included officiating in County 2nd XI fixtures and other top leagues in Lancashire, partnered by such colleagues of international calibre as Don. Oslear. This rare opportunity to observe at close quarters how the game is played in England, plus his earlier personal experience of playing Cricket at first-class level, augers well in cascading appropriate information to novices through the pages of this volume. What is perhaps singularly remarkable, is that his academic qualifications - B.Sc.(Hons. ), M.Sc., followed by his election as Fellow of three international bodies, (The Royal Society of Chemistry, London; the Institute of Chemistry, Ceylon and of Quality Assurance, England) - have all been acquired simultaneously in tandem and parallel with his many Cricketing achievements. This should not be all that surprising to those familiar with aphorism: If one needs to find someone to undertake a difficult task, then look no further than to a man who is known already to be heavily involved in another direction! In November 1992, a personal dream came true for Ajith when the Sri Lanka Cricket Board selected him to join the six-member Test Match Panel of Umpires for the tour of New Zealand cricket team there and was appointed to stand in his first-ever international at the R. Premadasa Stadium in Colombo. Sadly, within a few days prior to officiating this precious match, whilst driving through a tropical storm, fate was to deal him the cruellest of blows, when a large wayside tree straddled his moving car and injured his spinal cord to leave him permanently paraplegic in the prime of youth! For a less determined character, such a devastating catastrophe would have been astronomical in its effects on future career prospects. Not so for Ajith, who, in spite of enforced physical impairments and even the absence of wheel-chair accessible facilities to the buildings throughout his country yet, his devotion, dedication and addiction to Cricket would not let him forego his passion for the game and he has since worked harder than ever, albeit with a decided change in emphasis. 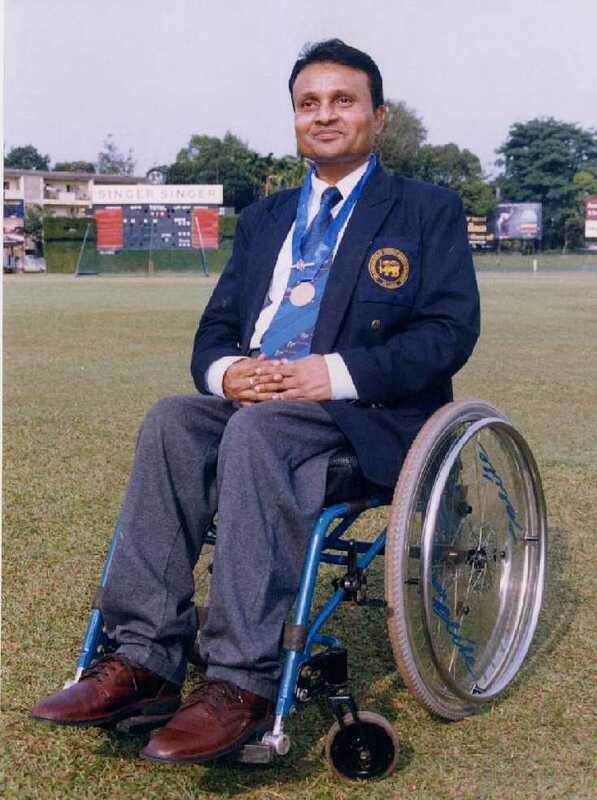 Despite being confined to a wheel-chair, he still wanted to be useful and in 1996 became of great assistance to the Sri Lanka Cricket Board as, single-handedly, he accepted and satisfactorily completed its highly technical assignment to streamline the rules and regulations governing tournament aspects of the game, to produce them on computer type-set on his lap-top. He was to follow this by writing with both charm and distinction, "The Golden Era of Sri Lankan Cricket", a literature best-seller, which described the fascinating story of his national team which blossomed out and established as International Champions in 0vers-limited cricket during 1996 / 1997. The measure of world reaction to this brave initiative may be determined from the fact that Wisden Cricketers Almanack, 2000, has since seen fit to regard him as one of only eight cricketing people to be specifically recognised for his many achievements and worthy contributions to the game and also that he became a proud recipient of prestigious " Star of Asia 1999 " award for Sports. All the while, the development of his academic skills was complementary to his abiding life-time passion - the pursuit of excellence in the great game of cricket, in terms of playing, its administration and the enhancement of its literature. The lurking danger in the development, improvement or refurbishment of any cause such as the one embarked upon, is that measures calculated to improve efficiency might unwittingly destroy something vital: one might build the body but destroy the soul. The soul in Ajith Pereras ambitions has been evident in the unselfish, altruistic, voluntary nature of his service. Ajith has given of his time unstintingly and has been motivated by an intense enthusiasm and faith in the integrity of the common objectives - to improve the overall standards of the game at all levels and in all places. May the time never come when those involved in Cricket ever measures the expenditure of personal time against the pleasures, satisfaction, prestige, or even self-esteem, the job or the gratitude of the beneficiaries gives him. Rather is the hope that the game will continue to be served by those whose hobby, principally, it is to do so, and gladly. This is the essence and very soul of cricket. Its encouraging to know that Ajith has this attribute in abundance. "You do well to love Cricket, for it is more free from anything sordid, anything dishonourable, than any game in the world. To play it keenly, honourably, generously, self-sacrificing, is a moral lesson in itself and the classroom is Gods air and sunshine. Foster it, my brother, so that it may attract all who can find the time to play it; protect it from anything that would sully it, so that it may grow in favour with all men. In my view, the Author is an apt evangelist to once again impart this time honoured truth of the real "Spirit of the Game", through the pages of his latest esteemed work: "Thinking Cricket - The Players Guide to Better Cricket". I am happy to endorse his message and to wish a successful outcome to his quest. 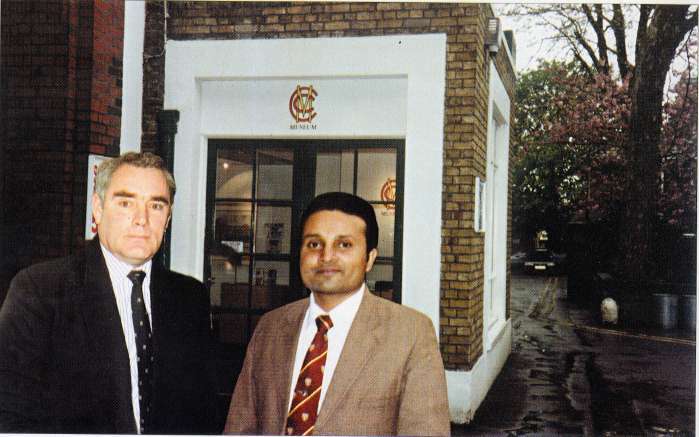 With Examiner and former England Scorer Alexander Davis, at Egbaston Test Match Ground Birmingham in 1990. 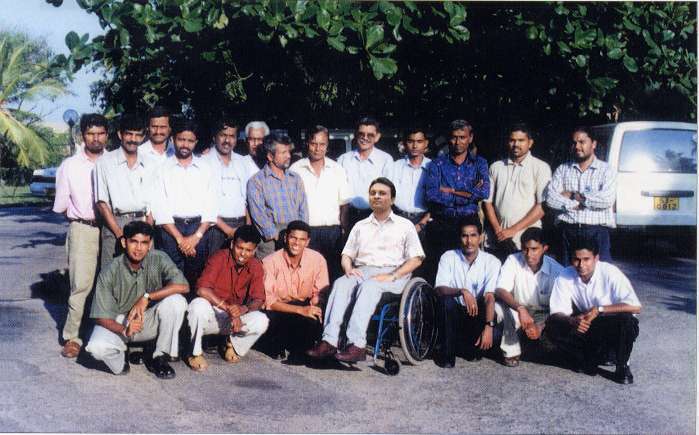 I had the honour of conducting the first ever formal training program for Sri Lanka's top Scorers, in preparing them for the Under 19 World Cup Cricket Tournament 2000 in Sri Lanka. 18 / 1, Arthurs Place, Dehiwala , Sri Lanka. Good on you mate !